by Ron Wolfson. Jewish Lights Publishing, 2013. After conducting extensive research that included more than 100 interviews and site visits, professor and author Ron Wolfson concludes that building a strong community that provides identity, purpose, and meaning for its members begins and ends with relationship. Here Wolfson shares many of his research results, such as offering “best practices” and success stories of those who have discovered the positive impact of building relationships in synagogues and other institutions. Wolfson provides an overview of different kinds of personal relationships, case studies, and skills and strategies for building relationships and community. Obstacles to relationship are real, however, and Wolfson addresses those as well. 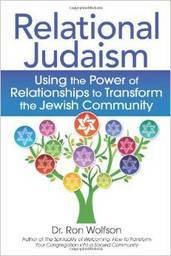 All synagogues leaders-clergy and laity-who are seeking a path forward into the future for their religious institutions will appreciate this helpful resource. It is user-friendly, accessible, and appropriate as material for leadership team studies or retreats.